Each hotel offers multiple on-site dining options, including buffet restaurants, lounges, and bars. If you would like to have a gourmet dining experience, we can recommend several nearby restaurants. The Palms Dining Room – Enjoy a wide selection of food choices for every palate at this “all you can eat” buffet. Children under the age of 9 eat free with a paying adult under our Kids Eat Free Program. Open daily for breakfast from 6:30am – 11:00am. International Pub – Meet at the pub after a long day in Orlando to shoot pool and listen to hit music on our jukebox. Enjoy your favorite beverages during our daily happy hour and order a meal off of the evening bar menu. Open daily at 5:00pm. Lite Bite Mini-Market & Deli – If you’re looking for a quick meal or snack, head to the Lite Bite. The deli offers fresh subs, salads, hot dogs, and bakery goods. In the market you’ll find plenty of snack items and beverages, as well as essentials you may have forgotten at home. Open 24 hours a day for your convenience. 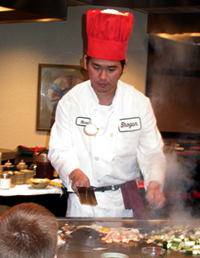 Shogun Japanese Steak House – Shogun will delight you with the entertaining skills of our teppanyaki chefs. Always a dining experience to remember, enjoy culinary masterpieces of beef, shrimp, chicken, and lobster. It’s the perfect choice for family gatherings or to meet up with friends and small groups. Open Sun – Thurs 6:00pm – 10:00pm and Fri – Sat 6:00pm – 10:30pm. For reservations, please call 407-352-1607. Plaza Garden Restaurant – A delightful setting to enjoy elaborate buffets for breakfast or dinner. Our signature Mickey Mouse waffles and evening ice-cream bar make dining with us truly an experience. Evening menu changes nightly so you’ll never get bored with the choices you’ll find. Families will love our Kids Eat Free program and seniors (55+) enjoy a 25% dinner discount all night long. Open 6:30-10:30 am for breakfast and 5:00-9:30 pm for dinner. Zebra’s Sports Bar – Enjoy your favorite beer, wine or spirit in the relaxed atmosphere at Zebra’s Bar, located just off the lobby. Meet with friends for drinks or grab a burger and fries or pizza while watching the big game on one of our many TV’s. Featuring nightly happy hour drink specials and lively Karaoke nights. Dine inside or enjoy the outdoor seating on our patio deck. Grille menu is available for eat-in or carry out. Open for lunch until late daily. Lite Bite Mini-Market & Deli – We’ve thought of everything to make your stay a pleasure. You’ll find every type of convenience item you can imagine in our well-stocked Lite Bite Mini-Market and Deli. Open 24 hours a day to satisfy your late night cravings. Features sandwiches, salads, fresh made pizza, chicken wings, an extensive selection of beverages, grab and go breakfast items and so much more. You’ll find everything you will need so stock-up your refrigerator today. Located adjacent to the lobby and features a large outdoor seating area and game room. Smooth Java Coffee Bar & Gifts™ – Start the day with your choice of many delicious premium coffee choices, gourmet pastries, fresh squeezed orange juice and fruit smoothies. Proudly serving Starbucks coffee. Browse through our book rack or choose from our wide selection of gifts and souvenirs. Pick up something to bring home to friends or just to help you remember your fabulous Orlando vacation. Open daily at 6:30 am. Located in the lobby.